I’ve recently reviewed a number of guitars that cost less than 300 dollars. This is my list of what I consider to be the best acoustic guitars under 300 based on those guitars. This list will most likely change as I review more guitars in this price range and I will update it as I find guitars that can beat any of these. However, I have also researched these guitars and others also agree that these are some of the best guitars that you can get for this price range. O.k. let’s get straight into the top 5. This guitar had to make this list just for the sheer low price of it. But it’s still a quality built guitar. It’s not going to blow you away – but it does not feel like a cheap guitar. I haven’t found anything cheaper than this that still feels like a quality made guitar and doesn’t feel like it’s made of cardboard or that it’s going to fall apart in 3 days. It’s a ¾ size guitar so it’s definitely small – so it’s most suitable to kids and smaller adults. 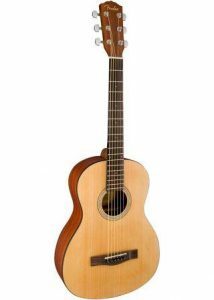 Or it would be great as a cheap but still decent travel guitar. Get the action lowered. This will make the guitar nicer and easier to play. If you’re looking for something a little bit different, but have a small budget then the Excursion might be on your horizon. It has a mid and treble heavy sound, especially for a dreadnought and produces a bright tone. It’s balanced and even and stays in tune well. You can get this guitar in a dreadnought or a Parlor size – and for either size you can choose to get it with or without built in electronics. But you’ll pay slightly more to get the version with electronics. Lower the action – as always! This is the first of 2 Yamaha guitars in this list (see #1). Which is no surprise. In my experience they are the kings of decent quality guitars at a low price. The APX500ii is a unique guitar in that it has a narrow body and a unique shape. The shape/size I would say is something like a grand auditorium or grand concert but with a thinner body (the sides aren’t as deep). If you’re looking for a reasonably priced guitar for playing live with, the APX500ii is a great option. It comes with built in electronics (which is awesome for this price) and the thin body makes it easy to play standing up. The sound is also suited to live playing – so it’s a good bet if you need a live acoustic but don’t have a lot to spend on it. Like the Fender T Bucket (see #2 below), the APX500ii has a number of color options (Red Metallic, Natural, Black, Sunburst, White, Blue Burst, Dark Red Burst). If you like a guitar to have a number of color options then the T Bucket definitely accommodates with 6 different color options (black, blue, sunburst, amber, violet and dark brown). But of course, the color options are not all that are going for the T Bucket. It has an even, balanced tone and stays in tune well. It’s not spectacular but nor do you expect that in this price range. 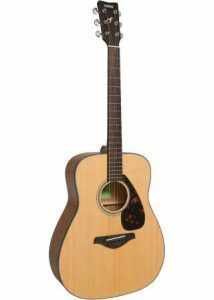 It is an acoustic-electric – so you get built in electronics, which is great to have a guitar that is like it is and also get electronics and still it comes in under $300. The other great thing about this guitar is that it’s already set up quite nicely in terms of the action (in my opinion) – it’s nice and easy to play without having to do anything to it. Yamaha are the masters of producing a great sounding guitar for a really low price, in my opinion. And the FG800 is the perfect example of that. It has a full, loud sound with a lot of oomph – far more than you’d expect from its tiny price-tag. And what’s more – you get a solid wood top – that’s unheard of for only $200. The downsides (and there will always be downsides to this kind of priced guitar – otherwise they’d cost a lot more) are that the action is way too high off the shelf (which is typical) so you’d definitely want to get that adjusted and, as with a lot of Yamaha guitars, you only get plastic nut and saddle. I would also change those. But otherwise the quality of this instrument is pretty amazing for the price. Thanks for reading and I hope this list has helped you to find the best guitar for you. Check out the links under each guitar above to learn more or check out my full detailed reviews of each guitar by clicking on the “full review” links. To see all of my reviews for guitars costing less than $300 check out the link below. Excellent line up of guitars to choose from for under $300 and I have a few friends that totally agree with some of the comments you made about the different companies and what to expect from some of them with the components and action. I have tried and heard of each brand you listed and was wondering what you think of Gibson guitars and do you know of any good pricing for 12-string guitars? There’s definitely some great Gibson acoustic guitars. Even though they’re probably more known for their electric guitars – particularly the Les Paul. But they’ve got some really nice high end acoustics and some great mid-priced acoustics. But they don’t have much on offer in the under $1,000 kind of range. That’s where the likes of Yamaha and Fender are really good. I haven’t had much experience with playing 12 strings to be honest. Just have never really ventured into them so I can’t really help you there. I’m a guitarist but I’m not a professional. I like you top 5 list. I’m just a amateur guitarist and I want to learn more but my guitar is getting old. You got a nice list I like the yamaha guitars because of the great reviews. Is the yamaha worhlth the money? How does the guitar last? 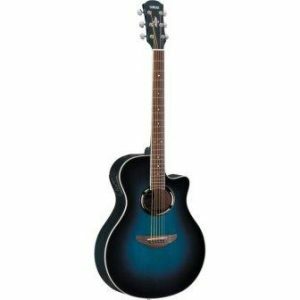 Yamaha make some great low cost instruments and acoustic guitars are no exception. Definitely worth the money. My biggest complaint with Yamaha guitars is that they tend to come with a high action (strings too high off the fingerboard) – but that can be adjusted so it’s not a deal breaker. In terms of quality build and sound for the price it’s hard to beat Yamaha. Not so much for higher end guitars but definitely for low priced guitars you get great bang for your buck. I don’t own a Yamaha myself so my experience with them is demoing them but I can’t see why they wouldn’t last as long as you wanted them to as long as you treated it well. The only thing that’s likely to reduce their life is the plastic nut and saddle that come on their lower cost guitars. But again, this is something that can be replaced so it shouldn’t affect the life of the guitar as a whole. This is a great article to help someone who wants to get into playing and wants something of decent quality. I know back when I tried playing it was just some off brand guitar at the local super store and it would never stay tuned and broke after about a week but now I know what to go for if I try getting back into playing so thanks! Yeah there’s definitely another level of guitar which is cheap and not worth the money. I try to get people to stay away from those. They tend to be so bad that anyone learning the guitar gets put off, as it sounds like you did. Like you say, they tend to go out of tune easily, be of bad quality and are typically actually really difficult to play. But you can definitely get some quality built guitars for a decent price if you know what to go for. I hope you get back into and give guitar another chance – and yeah like you say definitely grab a decent instrument for it. You don’t have to spend a fortune but you do have to do your research to make sure you don’t get a dud. Back when I was much younger, I watched my father play on his guitar every so once in awhile, and when he did it was a treat. Unfortunately my siblings broke that guitar long ago, but the memories still stick with me, I’d love to be able to play and own one for myself! That’s the great thing about guitar is that it’s easy to get into. It’s a small portable instrument – and, as you can see in the list above, there are actually some really decent options to get started without having to invest too much money. Also check out my top 6 beginner guitars in the link below. 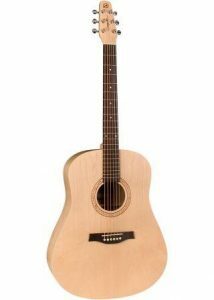 I personally don’t play much acoustic guitar, but I’m looking for one for my daughter. She wants to learn and I don’t want to spend too much money on her first guitar. At the same time though, I want to buy one that has a bit of quality about it so she will enjoy playing it and stick with it. 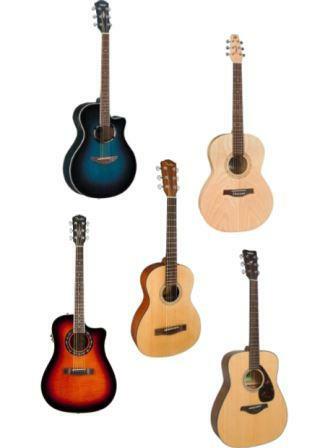 You’ve offered up a good selection of guitars here at extremely reasonable prices. I’m definitely going to look into a few of these further. I want to get her one for Christmas. Thanks for your message. I think you’ve got the right thinking there when it comes to a beginner guitar. You definitely want something of enough quality that the instrument will actually be good for learning on but of course don’t want to pay too much in case they don’t stick with it.